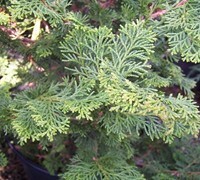 Thuja Standishii X Plicata 'Green Giant' is a fast and very fast growing tree that can be grown in USDA Plant Hardiness Zones 5A through 9B. It matures to an average height of 40 feet to 50 feet and an average width of 10 feet to 15 feet, depending on climate and other environmental factors. It prefers growing in a location that provides full sun and grows best when planted in sand, loam or clay soil that is well drained. 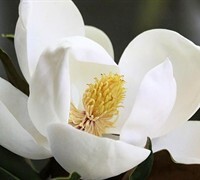 It attracts wildlife, visual attention and songbirds / birds and is resistant to deer, drought, insects, diseases and heat. 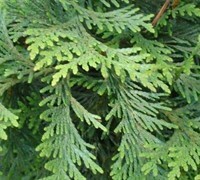 Green Giant Arborvitae can be useful in the landscape as a buffer or screen, as a background, around decks, swimming pools, and other outdoor living areas, to provide shade, as a focal point, in landscape beds or islands, to add property value, in small groupings, as a hedge or in medians and also in theme gardens or bog gardens. 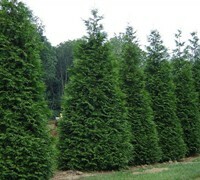 Green Giant Arborvitae is a fast growing evergreen conifer perfect for creating a tall screen or buffer. Once the root system becomes established in the first growing season rapid growth will be the result in subsequent seasons. In some cases you can expect 24 inches of growth in a single season and, in some cases, even more. 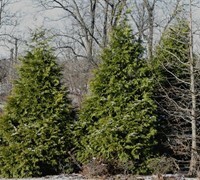 At maturity this narrow, pyramidal growing conifer will reach 40 to 50 feet tall and 10 to 15 feet wide. 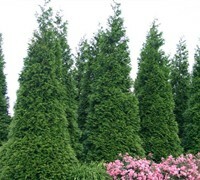 Green Giant Arborvitae prefers a well draining slightly acidic soil and plenty of sunshine but will tolerate a little shade. 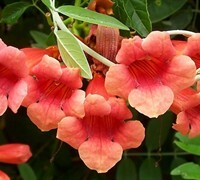 It requires no pruning and is quite drought tolerant when established. Fertilize in spring and again in late summer with a well-balanced shrub and tree type fertilizer. Avoid planting underneath powerlines. It is very deer resistant.